Man, I must've eaten at Pho Hoang a dozen times over. 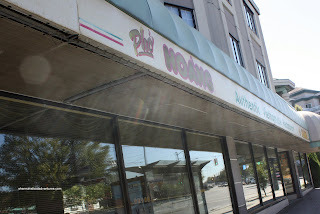 For some reason or another, this has been a place we go for Pho, even though it looks completely disheveled from the outside. Well, the inside might need a bit of a makeover as well. 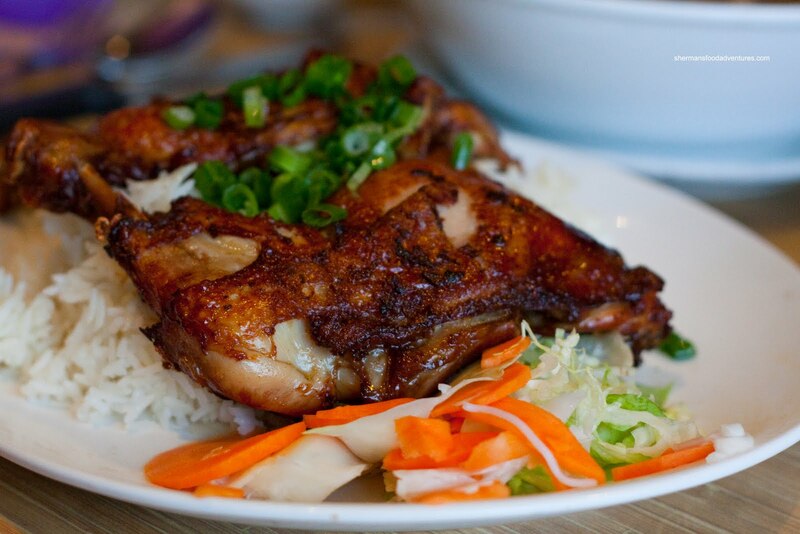 However, this place could be considered "nice" compared to other Vietnamese restaurants. In reality, we pass by this place often and merely eat there for convenience's sake. Sure, there is better pho out there; but we always know what we're gonna get here. For me, this visit was by myself and I can only order so much. To change things up a bit, I went for the Charbroiled Chicken to start. Similar to the chicken you'd find with a rice dish, it was tender and sweet. By virtue of being thigh meat helped. It came with a sweet fish sauce; but I really didn't need it. Of course by default, I always go for the Pho with everything, otherwise known as the Phở Dặc Biệt. Now for some reason or another, I had put off finishing this post for a long time. How long? How about nearly half a year! I'm not sure why I left this post hanging. Well, it was so long, that I had actually returned for another visit by the time I considered finishing it off. 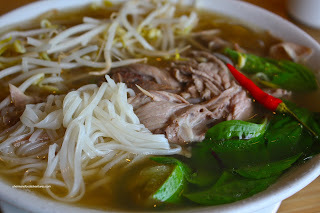 So I will now talk about the Pho based on 2 visits. I would confirm that it is indeed consistent. The broth is on the sweeter side and relatively light. Not exactly screaming out flavour while not being too salty either. The noodles were plentiful and al dente. Both times, there was an ample amount of meat which was tender and cut properly. Basically, an all round good bowl of Pho. There are better; but this does the job. 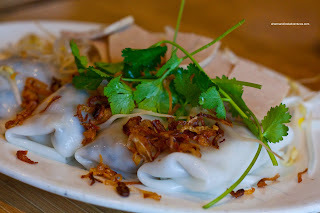 On this subsequent visit, we got an order of the Bánh Cuốn or essentially rice noodle rolls filled with wood ear mushrooms, pork and onions. 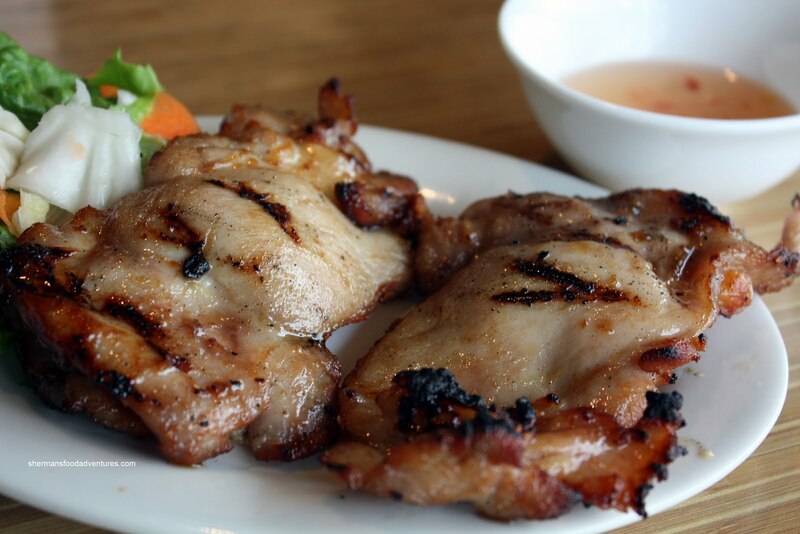 Usually, it is accompanied by slices of Vietnamese ham as well. We found the ones here to be pretty good. The rice noodle roll was soft while still retaining some elasticity. The filling was quite tasty with plenty of fish sauce. The only thing we could fault with these rolls was that they fell apart when we tried to pick them up. Of course when my son is around for a meal, we have to order Spring Rolls. I must give them kudos for using rice wrappers; however, I will have to say that these were a mitigated disaster. Completely overcooked, greasy and generally unappealing, I was surprised my son ate any of it. They were so over done, the exterior was no longer crispy - if that makes any sense. 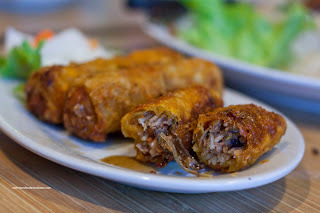 What we got were chewy spring rolls that spurted out oil every time we bit into it. Yuck. Predictably, Viv ordered the Lemongrass Chicken on rice for herself. It was a generous portion with 2 full chicken legs and plenty of properly cooked rice. But we found it a chore to eat since it was not deboned. Yes, there is an argument that meat tastes better when it is attached to the bone, much like a T-bone steak. However, I can't see this really with a chicken leg. So despite it tasting quite good with a good amount of flavour (maybe needed a bit more lemongrass though), we sort of gave up eating it. Remember, we had 2 kids to attend to, my incessant picture taking and trying to eat ourselves. Any extra effort to eat our food was not welcomed. If I had to sum out the food here, I would say it is serviceable. It did the job and it was generally not bad except for the spring rolls. Yet, It wouldn't be my first choice along Main Street, I would save that for Pho Tan. you should try their spicy soup, it's the only thing that makes me go back there repeatedly. unlike most places their spicy soup isn't just their normal soup with chili oil in it. agree with the comment above! I just went today for lunch. I really enjoy their bun buo hue. Lots of key ingredients in there rather than just chili oil like what the person above said. Actual lemon grass inside! Looks like I need to return for the Bun Bo Hue!